"Good morning...there is another event at the Bladensburg waterfront today if you have time to check that out I know you are always looking to capture some good photos." The text came from this guy. He goes by King. This photo is from the Mount Rainier Day festival in May, which is where I first became aware of this incredibly gifted individual. 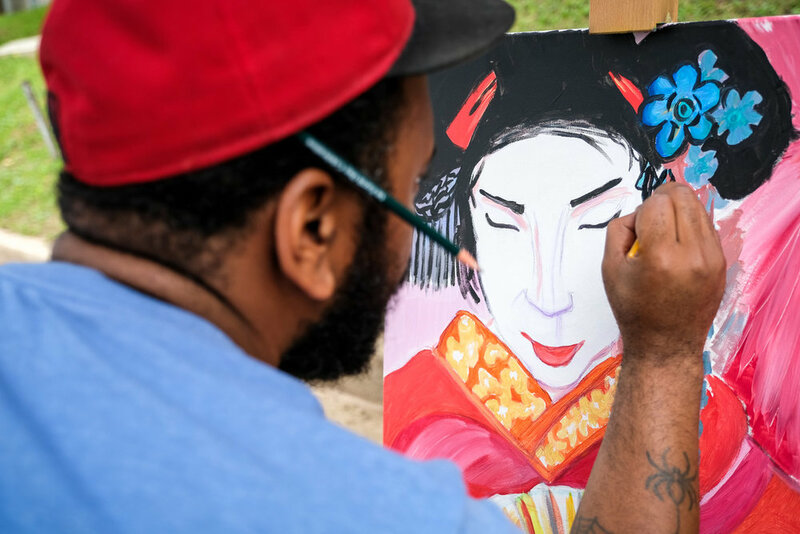 I'm going to start this blog post with a mini feature on King's work, and then move into images from the Waterfront Art Festival. I really needed a mental health day yesterday and his "out of the blue" text was exactly what I needed. Saturday was going to be another gorgeous day spent in the house, toiling away on the grind of running a photography business. King's text got me out of the house on a perfect blue sky day, doing what I got into photography for to begin with. As I wrote about just a couple of days ago in one of my articles on LinkedIn, when you run a photography business, you're only spending about five to ten percent of your time actually doing photography. The art festival was a much needed break from the grind. 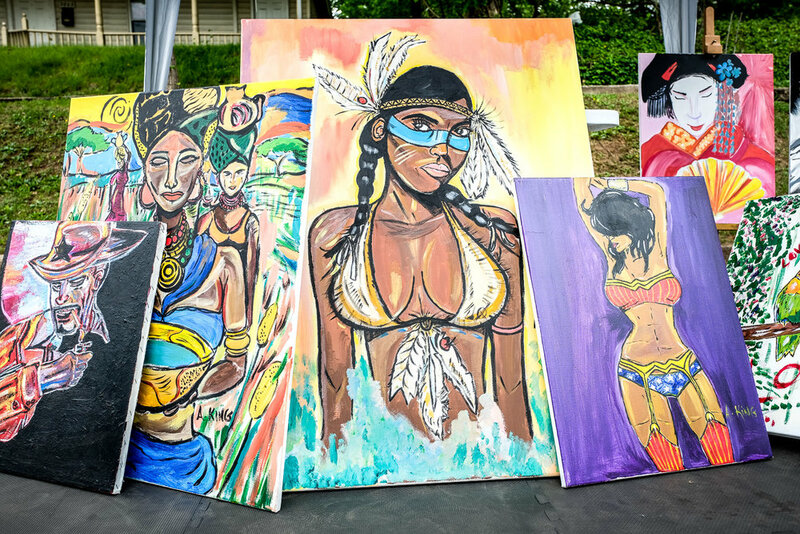 Some of King's work from the Mount Rainier Day festival back in May. Some of these may still be available for purchase. 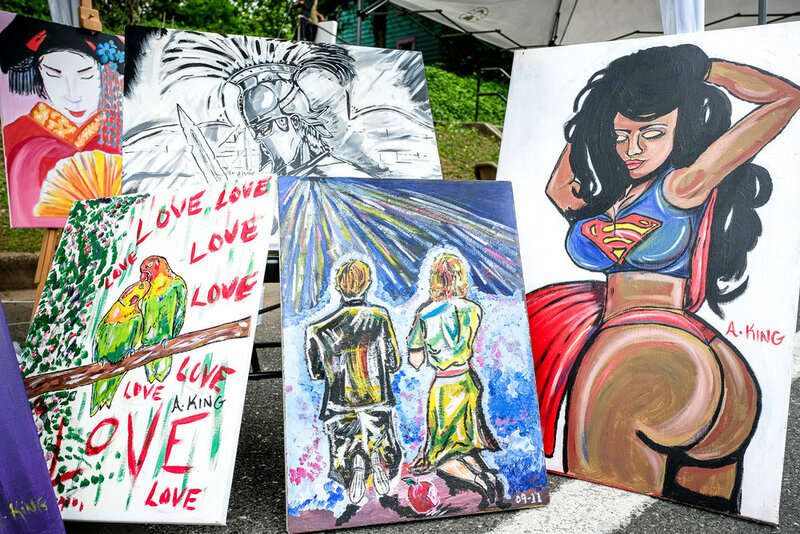 More of King's work from the Mount Rainier Day festival. Again, some of these may still be available for purchase. Last of the images from the festival back in May. Now we're at yesterday's Waterfront Art Festival. Different festival, same ole King. 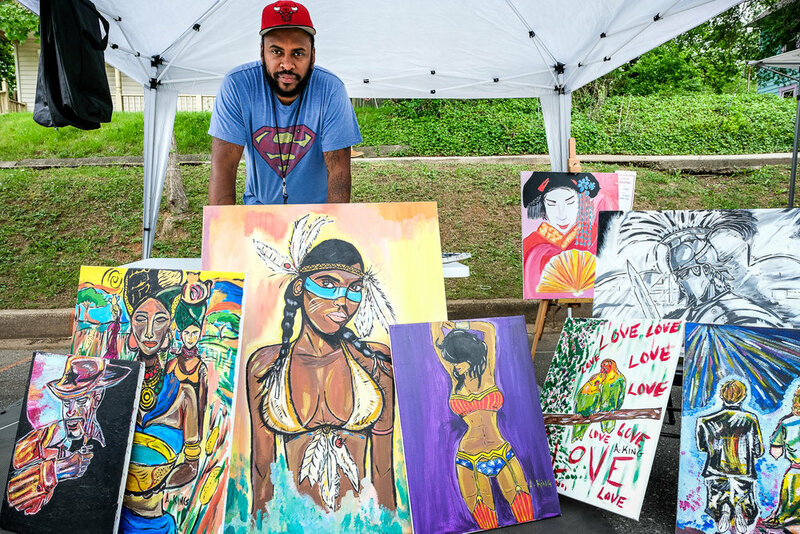 As you can see, art festivals are a family affair for this artist. He had his whole tribe out there with him. If there's a spot on your wall that's perfect for any of King's work, here's how to reach him: You can click here to see lots more of King's work on Instagram. You can also purchase his work through his website. Or give him a call at (240) 461-7313 if you want to commission him to do something one-of-a-kind. Ask him to show you the Harlem Nights piece someone commissioned him to do. It is stunning. We're not going very far. Just right next door to talk to Shari. This is Shari Flynn and she's a glassblower. If most of these look like brains, it's because they are. I know someone with an aquarium that these would be perfect for. Why go to the store and buy the stuff that everyone has when you can have something unique? Shari makes all kinds of stuff that's both functional, as well as beautiful. If you'd like some custom drinkware either for yourself or to give as a gift to someone, reach out to Shari and see some of the amazing stuff she has. Or commission her to do something custom. She told me when the glass is hot, it's the consistency of honey and she can embed stuff in it. Maybe instead of giving someone a mug with a picture on it, you can give them some glassware with something unique (that can handle a lot of heat) in it?! I don't know. I'm certainly no expert on this, but Shari is and that's why you should talk to her! You can reach Shari at ShariFlynnGlass [at] gmail dot com or at (240) 398-0443. I'm twisting her arm to get her to sell her products on Instagram where it's easy for people to click to purchase. If you reach out to her, be sure to ask "Hey Shari, why aren't you on Instagram so I can buy your stuff online?" Okay, I'm done talking. Now, I'm going to just show you images from the festival. There were lots more artists there than what you see here, but this was a day off for me, so providing full event coverage was not my objective. This is the work of one of the three sisters at Different By Design. Two of them are artists. The third one is a master of the art of counting the money. There's LOTS more of this to see on their website. You can also reach her on Instagram @hennafy or via email: hennafy [at] gmail dot com. This is one of the little signs at the Hennafy Tattoo booth, but I'm sure it applies to all the artists. Support your local artists. When you need to decorate your home or give someone a gift, don't go to a big box store. There are local artists all around you producing incredible things that you can't get from the usual suspects.